March Madness is in full swing with tip-off just hours away for this year’s NCAA Basketball Tournament. 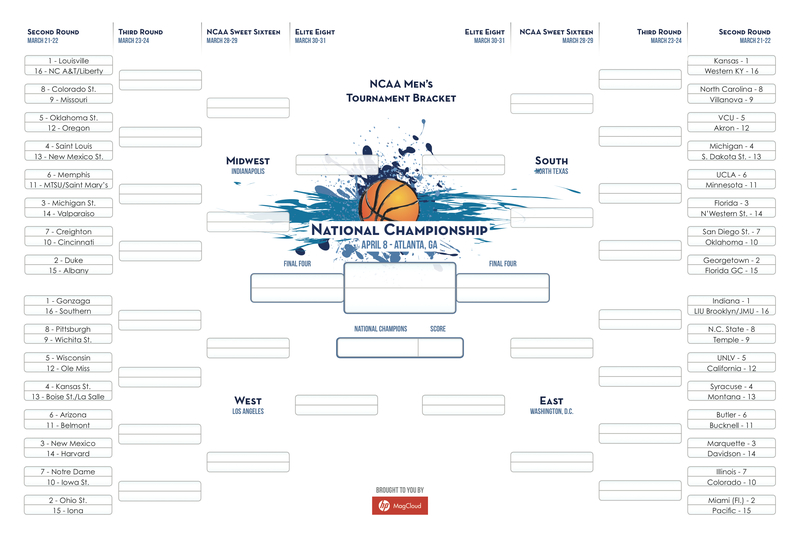 So whether you are a tourney stats master, like to pick based on your favorite mascots or simply want to show support for your alma mater, show-off your picks with a cool Bracket Poster. Once you’ve exported your PDF, upload your completed bracket to MagCloud and order a copy of your custom poster, picks and all. MagCloud Posters are just $2.00 for a full color front and back professionally printed poster that will look great in your office cube, dorm room or on the fridge, so you can track your team’s road to the Final Four. Share who you are pulling for in this year’s tournament or other ideas you have for MagCloud posters in the comment’s section below. Feel like your business collateral needs a little refresh? Let us help out with our brochure and flyer templates. This four page 8.5 x 11 Pamphlet template is an easy way to create a great looking company, product or service brochure that is MagCloud-ready. To learn how to use MagCloud with a variety of software applications and print products see our Getting Started page. Our Flyer product is great for customer case studies, data sheets, real-estate sales sheets, menus and more. 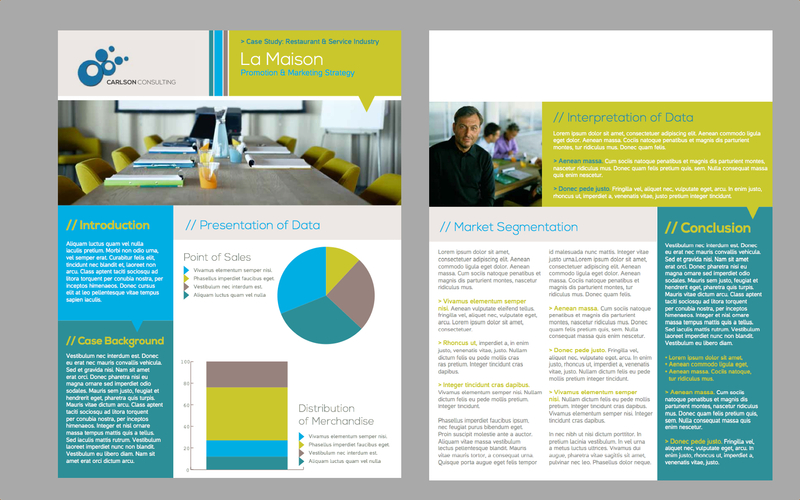 Download our case study template to showcase your latest sales wins and solutions. Let us know what you think of our templates and how you might use them in the comments section. There is nothing better than seeing your work in print. And we love how HP – MagCloud makes this possible and painless! At Two Bright Lights we focus on connecting magazines and blogs with great images from photographers and other creative businesses, so we understand the importance of beautiful magazines and business collateral. Many of our members use and love MagCloud. Whether they are photographers using it publish a portfolio or pricing guide, or editors using it to publish a print and digital magazine, HP MagCloud makes displaying and distributing their content a breeze. Photographers, publishers, brides, and vendors have created thousands of beautiful publications using MagCloud, but we wanted to pass on what a few Two Bright Lights editors have to say about MagCloud and share details about the beautiful magazines and publications they create. Meet Kym Stelmachers of DIY Weddings Magazine and Erika Pitera of Zest Digital Magazine. Shalyn Kettering: Could you tell us a bit about your publication and editorial style? Kym Stelmachers: DIY Weddings® Magazine is a wedding publication that is written and created by brides for brides. We cater to the bride with a budget of $15,000 and under with our main focus on the DIY. We provide DIY projects from brides, wedding planners, wedding vendors and crafters. I designed the publication to be a “visually pleasing” experience for our readers. We also decided to change the way we do advertising in our publications by developing a new innovative way to get the same content to our readers without the headache of having to thumb through endless ads to find the real content. We were the first wedding publication to offer its readers a better reading experience. Erika Pitera: ZEST Digital Magazine is a seasonally focused mix of recipes, entertaining menus and easy, do-it-yourself home and holiday decor projects. Our goal is to inspire our readers with recipes, DIY projects and entertaining ideas that are approachable for both new and experienced home cooks. SK: How does MagCloud fit into your publication process and what have you found most helpful about it as an publishing platform? KS: Because we are primarily a digital magazine, we wanted to be able to offer our brides, vendors and photographers the option to purchase a hard copy. When we found MagCloud, we knew they would be a great fit for what we were looking for. It really became clear to us that we made an excellent choice when we received our first proof. The quality of their product is first rate! I hear it time and time again how beautiful our print publication is. MagCloud uses quality paper; the color is vibrant; their delivery and customer service is exceptional. EP: In all honesty, it didn’t at first! When we first started ZEST, we only envisioned it as a digital publication. However, in exploring all of the publishing options out there, we were thrilled to find MagCloud because it allowed us to print our magazine with ease! Its accessibility and quality encouraged us to start designing our publication for both digital and print readers. MagCloud is great because it’s user-friendly. My reasons for that are two-fold: from a reader/consumer standpoint, it’s very easy to discover publications based on your interests or hobbies; from a publisher’s standpoint, MagCloud makes it easy for small publications to print small runs of awesome quality at an affordable price. SK: What are your top 3 tips for first time MagCloud users? KS: Really they makes it so easy to upload, setup, price and manage – anyone can use it. My only tip is to always order a proof so you know what you are offering your customers. EP: 1. Be sure to follow MagCloud’s formatting instructions to get perfect results every time. You can get specific instructions customized for your publishing software that make it really easy to export your PDF properly. 2. Take advantage of the document preview to make sure all of your text and important elements are in the safe zone so that nothing gets cut off when it’s printed! 3. Get the most out of the your experience by offering both print and digital versions. SK: Kym, We love all of your creative DIY tips in your magazine! Your sea shell bouquet in the last issue was fantastic! Where can people purchase it on MagCloud? KS: Our Winter 2012 issue just arrived on December 1st and it’s our biggest issue ever. We have more inspirational ideas, do-it-yourself projects and 12 experts in the wedding industry giving our readers some great tips, advice and budget saving ideas. In each issue FiftyFlowers.com creates 3 DIY Flower Bouquet projects. What I love about it is they include an inspiration board and they provide the reader with a materials list and step-by-step instruction. We have gotten so much great feedback that we are going to continue these projects through 2013. You can purchase all of our issues on MagCloud under DIY Weddings® Magazine. SK: Erika, The pear on the cover of your current issue looks delicious! Where can we get the recipe? EP: Those are our Port Wine Poached Pears – they’re yummy and pretty easy to make. You’ll find the recipe on page 28 of our Holiday 2012 issue. SK: What sort of submissions are you looking for from TBL members? KS: I am glad you asked! We have a very special issue coming in 2013 and we are looking for anything that has a “red theme” about it. We will consider any of the following using a red theme: Photo style shoots, weddings, candy buffet tables, cake or sweet displays and engagements. Style shoots and weddings with themes around the circus, boardwalk, carnival, Valentines, Christmas, Fourth of July – keeping in mind that we are focusing on “red”. We look forward to working with all the talented photographers at Two Bright Lights! EP: Your number one priority should always be to make the food or drinks look real and absolutely delicious! Natural light is a very powerful tool. I love food photos that are bright and appetizing rather than dark or dramatic. Props can be great, but make sure they don’t detract from the star of the show! Also, shallow depth of field can really help the food take center stage. A big thanks for Kym and Erika for the interviews! Don’t forget to check out their magazines on MagCloud and if you are interested in having your photography featured in these and other great magazines check out the Two Bright Lights’ submission software! By now, you’ve seen some of the investments the social media community has made in Pinterest. The visual inspiration engine resonates with communities in such a natural way it’s no wonder that the little network that could is on a meteoric growth trajectory. But as Pinterest usage and prevalence increases, marketers are beginning to ask themselves how best to leverage the platform to get its message out. MagCloud publishers have been using Pinterest for some time, with good success thus far. We’ve reached out to some “Pinteresting” publications to understand more about Pinterest’s benefits: Cory Ann Ellis (Pinterest page here)– of AC Ellis Photography, SD Wedding Style and The Cake Lady Bakery – and Trey Hill – who uses both MagCloud and Pinterest for Square Root of Nine, a story telling agency. Have some thoughts, tips or ideas of your own? Let us know in the comments! And as always, if you’d like to respond to us or the authors, the comments section is the place to be. MagCloud: Have your publications used Pinterest for promotion recently? What have you seen from the platform that made the promotion unique? MagCloud: What do you think Pinterest might offer publishers that is unique to publishing (as opposed to the advantages for other small businesses)? MagCloud: What are some tips that may help other publishers to get started on Pinterest? MagCloud: Pinterest is a highly visual social media platform, how can you use that style to promote your publication? Get rewarded when friends, family or colleagues sign up for a MagCloud account and become publishers. Existing MagCloud users can earn $10 for every friend they refer that joins MagCloud and buys or sells $25 worth of their own published content through the website. Sign-in to your MagCloud account and share a link to a publication, seo company, a publisher profile, even a MagCloud web page via the MagCloud website or web viewer. Your friend signs up from that link and becomes a new MagCloud member. They publish their first MagCloud publication. Then your friend buys or sells at least $25 of their own published content. You will receive a $10 cash credit for your referral. You don’t need to sign up for our referral program all MagCloud members are automatically eligible. Just start sharing links (while signed-in) from the MagCloud website to participate. For more information see our website or FAQs.